The Glenelg River is both one of the most significant and one of the longest rivers in Victoria, home to a wide array of native fish and much valued by canoeists, anglers, farmers and tourists. The river rises in the Grampians National Park and flows west through Harrow and then south to Casterton and Dartmoor for around 500 kilometres. A short stretch of the estuary winds through South Australia before returning to Victoria to enter the sea at Nelson. The Glenelg River supports a range of Aboriginal cultural values along its length. The Glenelg River is an integral part of the Wimmera-Mallee waterway system, supplying water to communities in the north-western region of Victoria. The Glenelg River provides tourism opportunities and is an important ecosystem home to a range of rare and threatened species. Visitors to the river enjoy fishing, boat cruises, canoeing, birdwatching and camping. Many farmers rely on the Glenelg River for access to stock water and use the productive floodplains for grazing. The lower section of the Glenelg River is recognised as one of Australia's 15 national 'biodiversity hotspots', meaning that it supports natural ecosystems that are largely unspoiled with native plants and animals still present. One of the objectives of providing water for the environment in the Glenelg River is to provide a healthy habitat for native fish, platypus, the critically endangered Glenelg freshwater mussel and the endangered Glenelg spiny crayfish. Native fish species include river blackfish, estuary perch, tupong and three species of pygmy perch. Frasers Swamp, in the upper Glenelg system, is home to a healthy population of growling grass frog, a vulnerable species. In 2017, the Glenelg River received much-needed relief from the dry conditions of recent years, with heavy rainfall in winter and early spring. 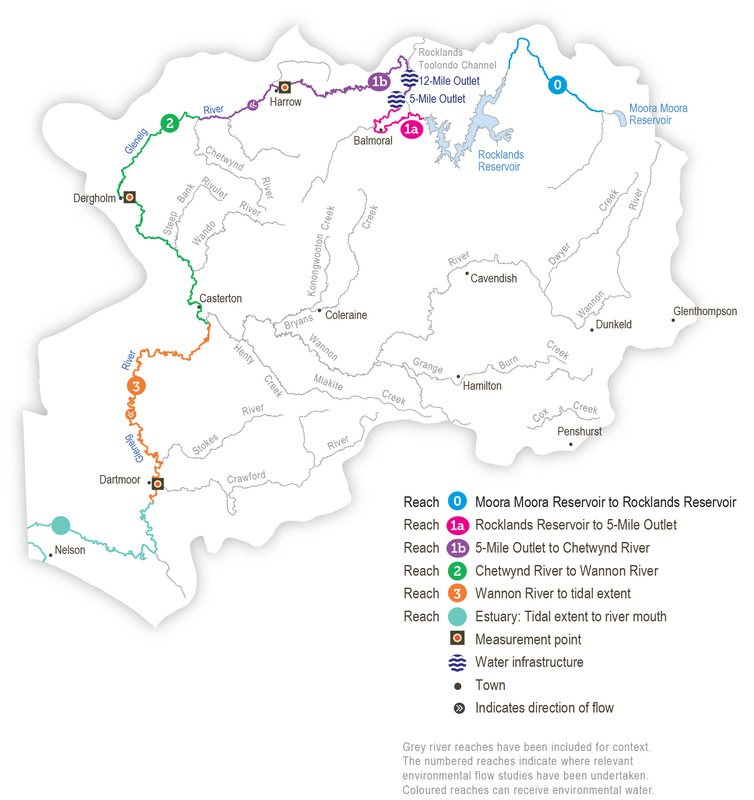 Drought had reduced the river to a series of pools in some areas and the heavy rain in winter/spring 2016 and subsequent high river flows reconnected many parts of the river. This provided opportunities for native fish populations to recover and recolonise the river following drought. Delivery of environmental water over summer proved critical in supporting their recovery following these high natural flows. "Since we started delivering water for the environment we have fish like estuary perch and tupong moving back into their old range, more than 270 kilometres upstream from where they were just seven years ago," said Glenelg Hopkins CMA Water Resources Manager Bryce Morden. Blackfish numbers have doubled and water for the environment was also beneficial for the endangered Glenelg spiny crayfish, which suffered from poor water quality in the drought. The river is popular with recreational anglers, who take part in several fishing competitions throughout the year. One of the high-profile events organised by the Victorian Fisheries Authority is the 'The Great Perch Search', where adult fish in prime breeding condition are caught by expert volunteer anglers from the Glenelg and Hopkins Rivers during winter. The fish are then flown to a hatchery in Narooma, NSW, where they help develop captive breeding methods for estuary perch. Nature and landscape photographers enjoy capturing images of the Glenelg River. From January through to March 2018, Glenelg Hopkins Catchment Management Authority is running a Glenelg River Exposed photography competition to give amateur photographers an opportunity to showcase the river's beauty and benefits to people and animals. There are great places for canoeing, camping and picnicking along the Glenelg River. The river is a key feature of the Lower Glenelg National Park and offers exciting opportunities for canoeing through a natural environment for over 75 kilometres from Dartmoor to its mouth near Nelson. There are also plenty of camping spots along the way. Aboriginal Victorians have a close connection to the Glenelg River. 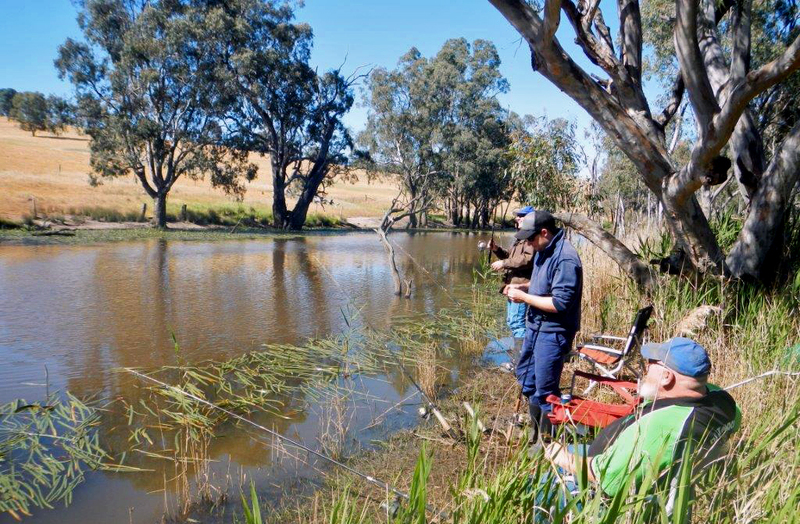 In 2017, the Towards Cultural Flows project provided the opportunity for Traditional Owner groups Gunditj Mirring and Baregi Gadjin to reconnect with the river, in partnership with Glenelg Hopkins CMA. "The purpose of the Towards Cultural Flows project is to see what is significant about the river system for Traditional Owners and to look at where the CMA can potentially support their interests in the Glenelg River through environmental flows," said Glenelg Hopkins CMA Project Officer Jane Walker. Water for the environment was delivered to the Glenelg River in March 2017 to support cultural values, coinciding with the Johnny Mullagh Memorial Cup, an annual cricket competition. The Cup celebrates the first Australian Test team, who were all Aboriginal men from the Harrow area. Environmental flows improved the water quality for animals and native plants, many of which are sources of traditional foods and medicines. The freshening flows also improved the water quality and amenity for river users, cricketers and spectators enjoying the important weekend. The waterway manager for the Glenelg River system is Glenelg Hopkins Catchment Management Authority (CMA). The CMA delivers water for the environment from Rocklands Reservoir to the Glenelg River to support a healthy waterway. The water storage manager is Grampians Wimmera Mallee Water while Southern Rural Water manages water resources downstream of Harrow. A total volume of 2,765 megalitres of water for the environment was delivered in 2016-17. One of Glenelg Hopkins CMA's projects is the Glenelg River Restoration, which is making river and soil health improvements to the upper Glenelg River. The project aims to establish partnerships with landholders to manage land to achieve both agricultural viability and ecological sustainability.